Select the Enable VMware tools quiescence check box to freeze the file system of processed VMs during backup. Depending on the VM version, Veeam Backup & Replication will use the VMware FileSystem Sync Driver (vmsync) driver or VMware VSS component in VMware Tools for VM snapshot creation. These tools are responsible for quiescing the VM file system and bringing the VM to a consistent state suitable for backup. For more information, see VMware Tools Quiescence. 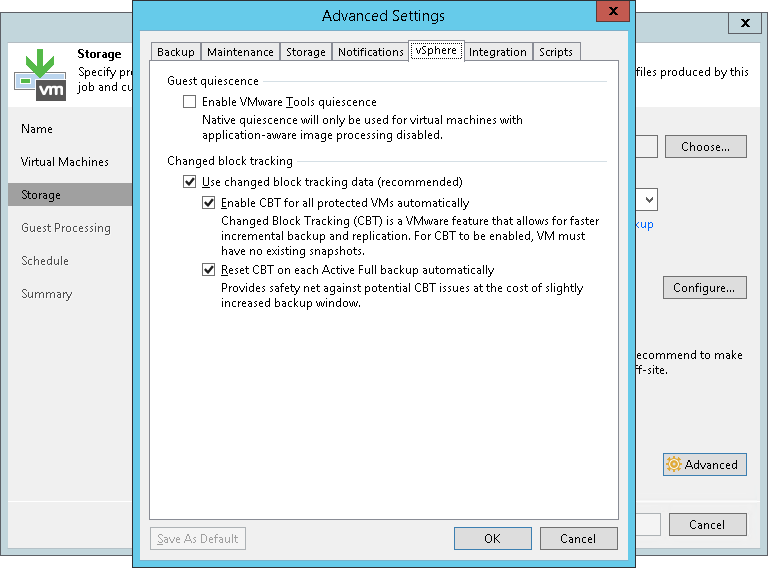 In the Changed block tracking section, specify if VMware vSphere CBT must be used for VM backup. By default, this option is enabled. If you want to force using CBT even if CBT is disabled at the level of the ESX(i) host, select the Enable CBT for all processed VMs automatically check box. For more information, see Changed Block Tracking. You can use CBT for VMs with virtual hardware version 7 or later.